More than 160 people were arrested during the Christmas drink and drug driving campaign in Suffolk, with more people testing positive for drugs than alcohol. The month-long campaign, launched on 1 December 2018, targeted drivers getting behind the wheel under the influence of alcohol and drugs. In Suffolk, 772 breath tests were carried out with 72 people providing positive readings, while 76 people failed drug tests out the 183 conducted. In addition, eight people were arrested for failing to provide a specimen, while six people were arrested for being unfit to drive through drink or drugs. During the 2017 campaign, 1,751 tests were carried out with 70 drivers providing positive readings. Of the 194 drug tests conducted 67 drivers failed. In addition, 10 people were arrested for failing to provide while four people were arrested for being unfit to drive through drink or drugs. This year again saw specific time slots at Ipswich and Norwich Magistrates’ Courts being reserved to deal with those caught drink or drug driving. This effectively meant that offenders could lose their licence within 24 hours of being breathalysed whilst facing additional fines. Chief Inspector Kris Barnard, Head of the Roads and Armed Policing Team (RAPT), said: "It’s disappointing to see that people are still prepared to take the risk and get behind the wheel under the influence of alcohol, although it does appear to be a minority of motorists. "A notable difference during this campaign is that there have been more drivers tested positive for drugs than alcohol. While this is a concern, drug driving is something we actively target all year round. It’s also a reflection of our increased ability to carry out roadside tests for cannabis and cocaine. Suffolk’s Police and Crime Commissioner Tim Passmore said: "These results are disappointing but they clearly show that if you are prepared to put yourself, and others, at risk by taking to the road unfit to drive or in an unsafe vehicle you stand a very good chance of being caught. I’d like to congratulate the Roads and Armed Policing Team on their unwavering focus on those who get behind the wheel under the influence of alcohol and drugs. 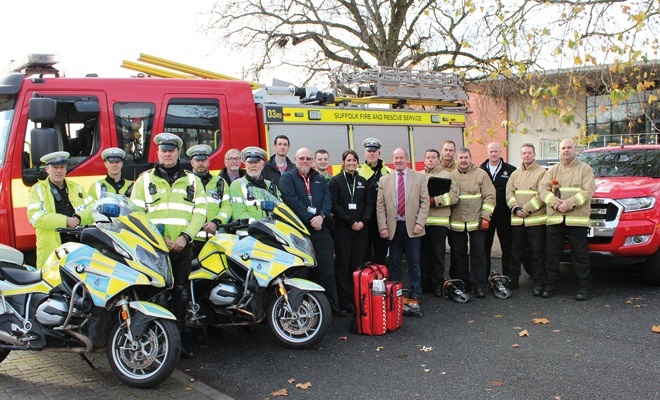 The launch of this year's Christmas drink-drive campaign at Suffolk New College: attended by Inspector Chris Hinitt & the Road Casualty Reduction Team; Tim Passmore - Police & Crime Commissioner for Suffolk; along with representatives from Suffolk County Council's Road Safety Team; Suffolk Fire & Rescue Service; and Suffolk New College. Suffolk’s Police and Crime Commissioner Tim Passmore, said: “Every Christmas we remind drivers of the dangers that drink and drugs cause behind the wheel and every year sadly there are still some that do not take heed. I find this extremely frustrating. 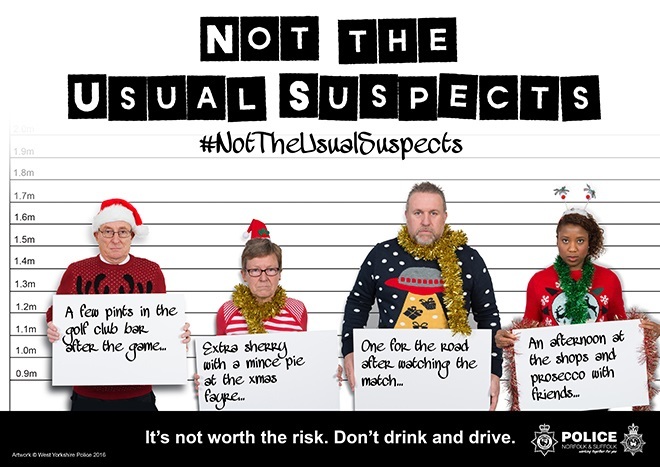 It beggars belief that despite the obvious dangers, too many motorists still take to the road under the influence of alcohol or drugs and as this campaign has highlighted it is not just ‘the usual suspects’. Cllr Mary Evans, cabinet member for Highways, Transport and Rural Affairs at Suffolk County Council, added: “This is a vital campaign aimed at those driving under the influence of drugs or alcohol over the Christmas period. Sadly, despite repeated warnings and the obvious dangers, many motorists under the influence still take to the roads. “This campaign once again highlights the terrible dangers and risks of getting behind the wheel when under the influence of drugs or alcohol. The campaign also challenges commonly held perceptions because the evidence shows that those caught drink driving are more likely to those aged over 35.